Since from their appearance the LEDs have shown great capabilities of duration and robustness with a minimal consumption of current but, for decades, they couldn't be able to provide white light for illumination. Only 7-8 years ago it has been possible to obtain white light from an LED of new conception. 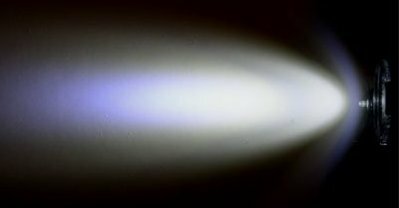 Like to the common fluorescent lamps, the blue light emitted inside of this LED crosses a fluorescent layer and becomes white. Many companies declare that their experimental white LEDs have already exceeded 200 Lumen/Watt of efficiency. This would mean that, in the future, the LED could illuminate our houses! Someone thinks that the fluorescent lamps too, with the technology called "cold cathode", will give large benefits to illumination. Currently white LEDs have an efficiency until 150 Lumen/Watt and, in the range from 1 to 5 watts, they have no competitors. For that reason they are performing a massive entry in the small lighting market like: emergency lamps, portable lamps, frontal and caving lamps.